A guy was showing this at a bike fair/sidewalk sale. I was showing some parts and the bikes my kids had outgrown. I did well, sold one of the bikes, 5 wheels, a few odds and ends. By the time I was packing up the guy with the Lotus was gone. The local bike shop helped me track him down, we met up and a deal was made. It was a bit dirty, had mis-matched wheels, and the original Shimano 600 Arabesque group. I cleaned the frame, touched up a couple of scratches, waxed her up, then rebuilt with a combination of parts I had and a new purchases, some from the local non-profit used parts bin. 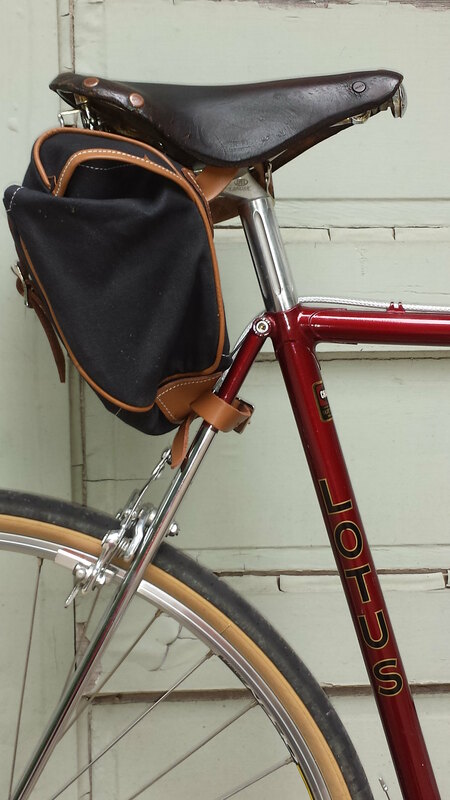 MAFAC Competition brakes, VO Croissant bag. MAFAC Competition brakes allow me to use Jack Brown 33.333 tires with room to spare. I originally had VO adjustable brake pads, but the room that the adjustable toe-in bits took up made it impossible to remove the wheels without deflating the tires. Going back to the OEM holders and salmon pad replacements give me both good braking, and keep my tires inflated when I remove them. Very nice looking bike! And a nice mix of components--excellent function and good looks, too. It is beautiful, nice job. Love your work! I had a 1984 Classique myself. Beautiful bike, just too small unfortunately. I found mine during the golden age of thrift stores (7-8 years ago), when you could find incredible bikes at thrift stores that weren't immediately gone in ten seconds. How do you like the Rustine hoods? 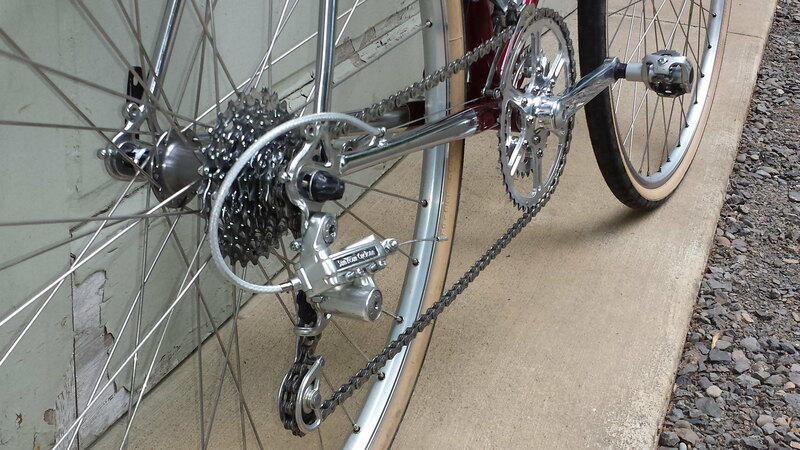 1st gen Cyclone is the prettiest derailleur ever made, IMO. Tsunoda would be glad to know you've kept it going in such a nice manner. 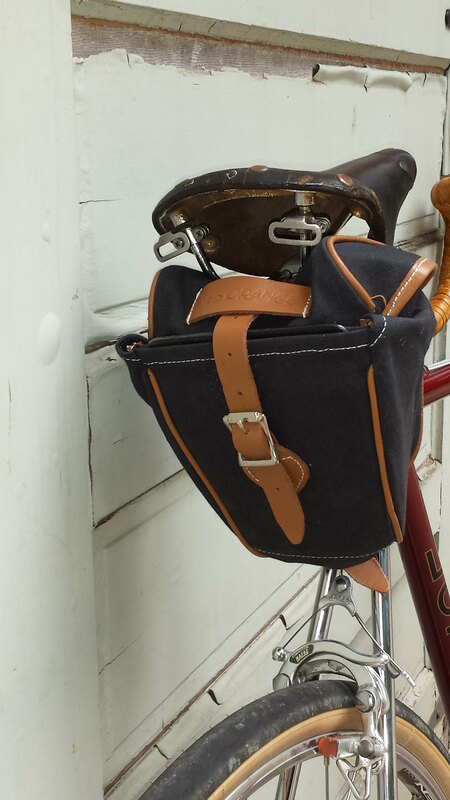 wow, elegant and practical, my favorite features in a bike. this is stunning. Tie with Huret Jubilee, IMO. But the Cyclone breaks the tie by actually shifting when you want it to. Quick update: The short cage Cyclone didn't have enough chain wrap, I was going to live with that and keep out of the small-small combos, but it just wasn't shifting well-off it went and on went a long cage version (but still 1st gen), even though I was saving it for another build. Just took this bike out on a 45 miler yesterday with some climbing. Shifting is sweet now. About 4 miles was on a gravel/dirt road, the 33.333s handled it well. One scary thing-the MAFAC levers I'm using have a slot in the top of the cast aluminum part under the hoods to make it easier to put the cable in. On a downhill the cable slipped forward through the slot. I was using some Jagwire ends that have a protrusion that fits into the hole at the top of the hood, since the brakes didn't come with adjusting barrels. I can micro-adjust the brakes using the cable stops I'm using, so I'm now looking for some MAFAC levers that don't have the slot in the front, hoping they're compatible with the posts so I don't have to redo the tape job. The other bike I like to ride is low trail, the front end seems light and twitchy in comparison. The shifter position right next to the brake levers is perhaps even better than bar end shifters. Note that you can't really use aero levers with the Command shifters-the cables for the brakes typically exit the lever right where the shift cables route. I tried different combinations of lever positions to try to make aero work, but they all compromised either the shifter or the brake lever position. 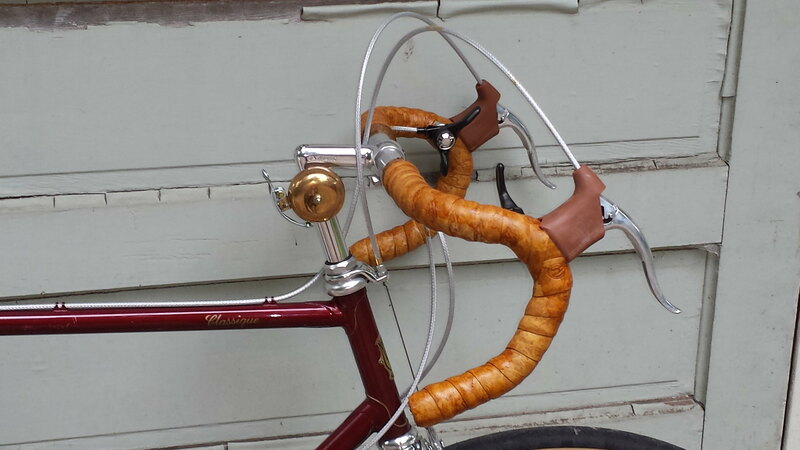 Years ago aero levers weren't around, we all looped our cables up and over the bars and didn't think twice about it. Funny now that you find older bikes that have been in shops for new cables, and the routing is either in front of the bars (wrong!) or too high or low-the fine art of adjusting the perfect curve of a cable housing isn't universally taught anymore, sadly. 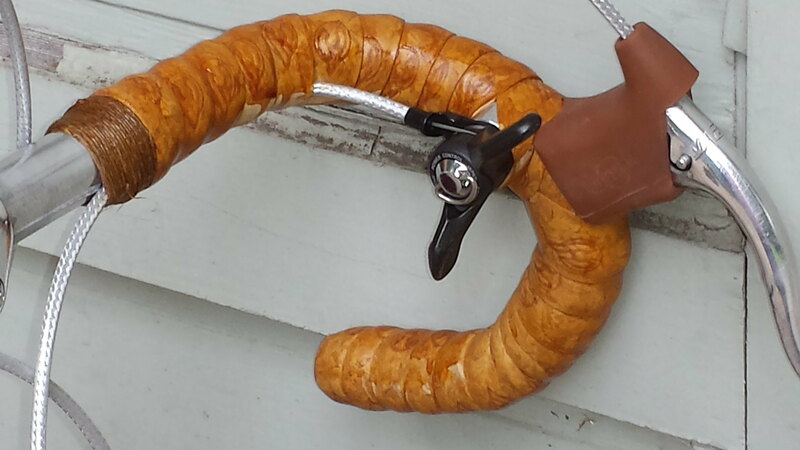 The Ideale 90 saddle is a bit different in shape than my Brooks, but my behind was just fine after the ride. All VO, the new ones have the VO Grand Cru laser engraving, I think. These were the older model I purchased on close-out. The Rustine hoods are just fine. I've seen the MAFAC reproductions that the guy in Spain is making, outside of MAFAC logo on the sides, they're fairly crude looking compared to the Rustine model. 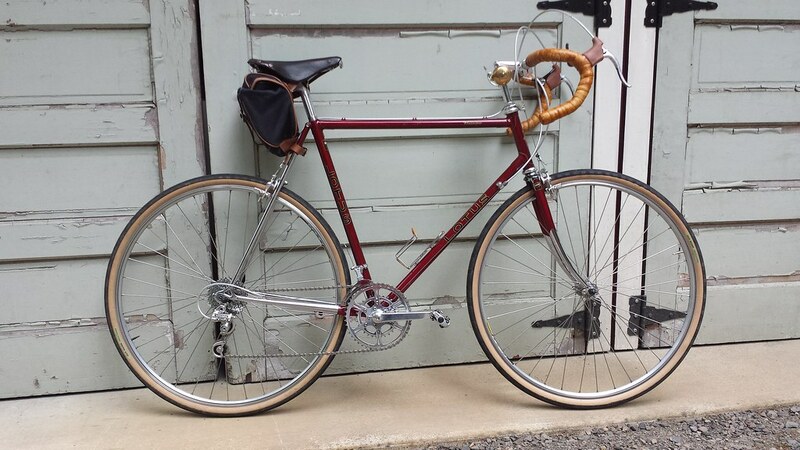 I need a set for campy non-aero on this '77 Colnago. This is an initial and affordable choice that can be upgraded later. Thanx!